Poetry. African & African American Studies. Performance Studies. Hybrid Genre. Music. Foreword by Charles Bernstein. Includes digital download code for audio. HANDHOLDING: 5 KINDS is a collection of experimental poetry as a creative response to 5 artistic works by innovative American, African diaspora and European-based artists' work: Kurt Schwitters' Ursonate (recited by his son, Ernst), Gertrude Stein's Tender Buttons, John Akomfrah's 7 Songs for Malcolm X, John Cage's 4'33 and Stanley Kubrick's Eyes Wide Shut. Each of these pieces strongly contextualizes Morris' own work and practice, dealing with the undertones and overtones of race, sexuality, class, gender, ethnicity, power and art-making. Each section is introduced as a reflection of what each piece means to the author and how they came about. The collection contains experimental text as well as 6 audio files (17 digital tracks). One is a "real time" response to the Kubrick film, the other is a collection of sound pieces inspired by the other artists, often recitations of the page-based texts. This is the first text and sound collection of Tracie Morris' that is comprised of exclusively experimental work inspired by other innovative artists. Tracie Morris is a poet, performer and professor. She is the recipient of numerous grants, fellowships, residencies and awards for poetry and performance. 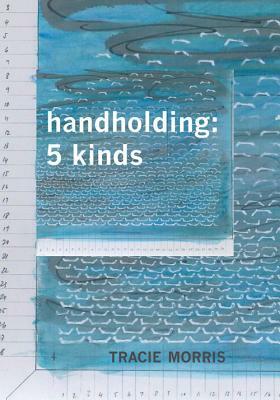 "handholding: 5 kinds" is her 3rd full-length poetry collection. Her credentials include an MFA in Poetry (Hunter College, CUNY), a PhD in Performance Studies (New York University). She studied classical British acting technique at the Royal Academy of Dramatic Art and American acting at Michael Howard Studios. She is a former CPCW Poetics fellow of the University of Pennsylvania. Tracie is Professor and Coordinator of Performance + Performance Studies at Pratt Institute, Brooklyn, New York.